No decks or roofs means the sky is the limit when playing on the Rainier Playground Structure. Uniquely designed with an open architecture, Rainier inspires hours of imaginative independent and group play. Rainier playground features 9 stimulating, accessible activities for children 5 to 12 years old, which assists in enhancing the ability to become more solution orientated, creative and physically and mentally strong. 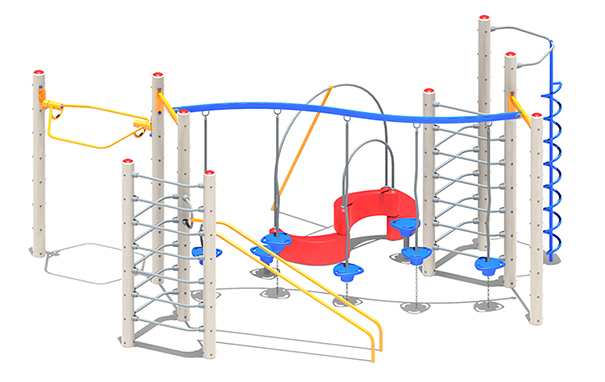 The combination of various overhead, balance and strength activities created by the Curly Climber, Banister Bars, Fire Fighter Tower, Curved Play Pod Traverse, Play Shell Climber and Push Pull station helps develop friendships, coordination and confidence. The wooden Rainier is constructed with sustainable Norwegian Pine treated with an EPA approved Copper Azol, which provides a safe and lasting finish. Constructed with longevity, safety and aesthetics in mind, Rainier features a colored accent post, 6"O.D. columns and is available in conditioned wood or a combination of recycled plastic and powder-coated metal materials. The Rainier Playground Structure is built from the ground up to provide access for all children to play, learn and socialize together. Use Zone: 32'0" x 27'6"